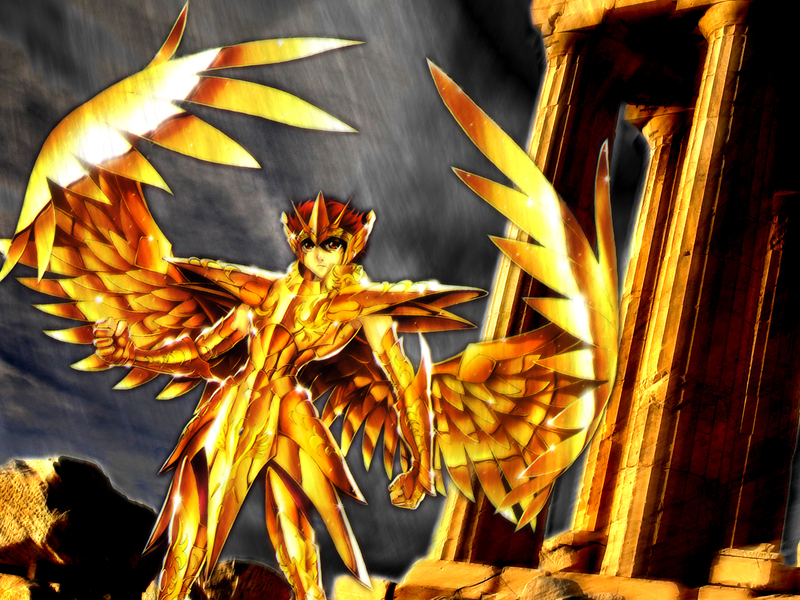 I was browsing the material for Sacred Saga Artbook of the Saint Seiya series when the idea of making this wallpaper popped up in my mind. doing this and that in the process, and finally this wallpaper goes for submission. this time, it's featuring Seiya of the Saint Seiya series. as I have already acquired the background material - it's from the photograph of Parthenon - I decided to approach something of a dark-yet-sacred atmosphere for the picture. adjusting the perspective and POV for the basics, then blending and a bit of filter touch for the atmosphere and effects... and finally, there goes this submission. anyway, very well done, I liked the extraction, and the background is quite alright, so thumbs for you! The good thing of Seiya's armor is that it's simetric, and no one will complain if some part of the armor is misplaced, so, points up! The color is very intense in the Character, and in the closer BG, but I think you sould have worked some more tones in the 'rainy' BG, but that's just a thought, so no worries, your work is very well done! Is that Seiya in sagitarius cloth? Or Aiolos?